The following list is all of the SUVs, crossovers and minivans that offer seating for 7 or more either standard or as an option in 2015. With over 40 vehicles to choose from that can carry 7+ passengers, we created this table to help you narrow down the options to the few that are in your range in terms of price, efficiency, style and space. Every year we award the top option in each of the following categories: Best Overall, “for the Money”, Fuel Efficiency, Minivan and Luxury. You can find our selections below the table. If you’re interested in how we come up with the overall ratings, you can learn how we calculate ratings. The 3rd Row Room column is in inches and lists the head, leg and shoulder room in that order. Finding the perfect combination of style, performance, and reliability in a 7 or 8 passenger SUV has never been easy, but consumers have some great options among the new 2015 models. Having a 3 row vehicle is a necessity for many families, especially those who need additional space to haul around cargo as well. It can be a little daunting to sort through all the new features and designs available while still being value conscious, so we’ve selected the top 5 SUVs of 2015 (each the best in its category) and summarized their main features and advantages. 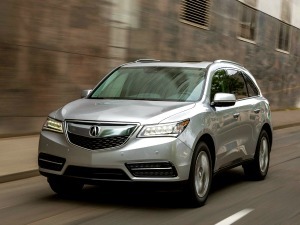 It’s the best selling 3 row luxury crossover ever made, and the Acura MDX shows no signs of losing popularity in 2015. The MDX underwent a redesign last year, and maintains that design this year. But in this case, unchanged is good. Consumer Reports gives this vehicle 88 out of 100 points after testing safety, handling, reliability, and owner satisfaction. Buyers can choose front wheel drive or all wheel drive, with a 290 horsepower V6 engine that gets 18 to 20 mpg in the city and 27 to 28 mpg on the highway. Drivers say the suspension and handling are athletic and responsive. The MDX has one of the roomiest interiors in its class. Rear seats can be folded down to carry big loads. Acura includes sound dampening technology into the MDX, making it one of the quietest rides around. Some of the glass is even noise resistant. Of course no SUV in the luxury category would come without all the latest high tech bells and whistles. Electronics packages include a rear wide screen DVD system complete with HDMI ports, a 12 speaker stereo system, Bluetooth, GPS, climate control, navigation and heated second row seats. Acura also applies the latest technology to safety features, offering a wide view camera, blind spot assist, forward collision warning, and lane keeping assist, which gently nudges the steering should the vehicle veer out of its lane. You can’t get a safer SUV either, as the Insurance Institute for Highway Safety rates the Acura MDX as a top safety pick, with the highest safety rating possible. The Nissan Rogue had a facelift last year, with updated contemporary styling. A little taller, and a slightly wider wheelbase provide a little more interior space. There is some big news with a new optional third row seat that can hold two passengers, for a total passenger count of 7. But where this SUV shines is in fuel economy, offering the best in its class with 26 city and 33 mpg highway. There is a new all-independent suspension system that improves handing, and Nissan’s Active Ride Control makes for a smoother ride on bumpy roads. 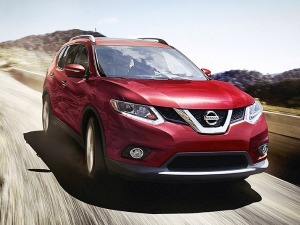 US News ranks the Nissan Rogue 4th out of 23 vehicles in the Affordable Compact SUV category. Test drivers praised the quiet cabin which has new heated cloth seats as an option for 2015. This sporty SUV also ranks high for safety, with the Insurance Institute for Highway Safety calling it a Top Safety Pick. A rear camera is standard, as are power windows, door locks and power mirrors, stereo with USB port, and Bluetooth technology. The SV model adds a power driver seat, climate control, push button start, and NissanConnect which integrates a smartphone. Other options include run-flat tires, advanced safety features, and LED headlights. 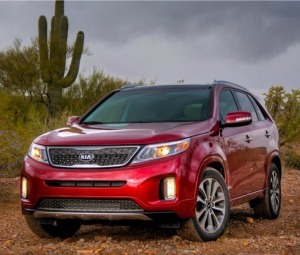 Kia has been steadily improving it’s mid-size SUV Sorento model in recent years, and buyers say 2015’s model is now one of the best 3 row seat vehicles out there. The interior cabin got a big facelift and is now on par with many of Kia’s other models. Consumer Reports gives the new Sorento 85 out of 100 points for reliability, owner satisfaction and performance. Base models come with a fuel efficient 4 cylinder engine that gets 20 city and 27 highway miles per gallon, but a V6 model with 290 horsepower is available. MPG drops only slightly with the larger engine, to 18 and 25 miles per gallon, so the tradeoff for improved performance may be worth it. Reviews in recent years criticized the Sorento cabin for feeling cheap, and this has been upgraded this year with better materials and metal trim. Bluetooth and a USB port are standard. Upgrades available include a rear facing camera, blind spot monitoring, a navigation package, and Kia’s UVO entertainment system. Updates to suspension components this year promise to be a big improvement in ride quality. In the affordable mid size SUV class, the Kia Sorento is a solid option for many drivers and beats competition such as the Hyundai Santa Fe in price, MPG, and utility. 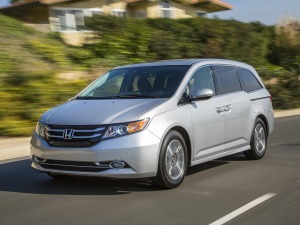 The Honda Odyssey is ranked first in the minivan class by US News, and for good reason. The Odyssey consistently scores high for safety, reliability and owner satisfaction. A V6 engine gives plenty of pickup and drivers say its handling is great for a minivan and lots of fun to drive. The Insurance Institute for Highway Safety gives the 2015 Odyssey high marks, calling it a Top Safety Pick. The configurable seating layout makes it easy to carry any combination of cargo and people. The optional split second row allows two seats to slide around, to make things more comfortable for adults in the second seat. The third row seat can also move around, and the Odyssey offers six placement options for child seats. The 248 horsepower 3.5 liter V6 engine gives it enough power to handle hills even with a full load. Fuel efficiency is slightly better than average for this class, with 19 mpg in the city and 28 on the highway. And Honda has seemingly thought of everything for a family on the go, with features like a built-in vacuum, and available entertainment center that includes surround sound and an ultra wide screen theater system. Other features include Bluetooth, a rear view camera, traction control, and lots of interior storage. BMW’s third generation of luxury midsize SUV, the X5, is more luxury and less sporty than previous models, perhaps going after Mercedes buyers. Drivers can pick from three engines. A turbocharged 6 cylinder engine is standard. A turbocharged 8 cylinder and a turbo-diesel are also options. All 3 performed well according to reviewers, providing plenty of pickup and zero to 60 times between 4.9 and 6.9 seconds (the latter time for the diesel). 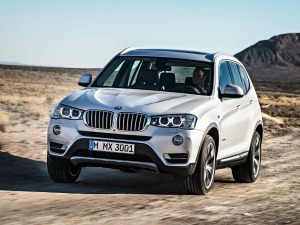 US News ranks the X5 at 2nd out of 18 luxury midsize SUVs due to high reliability, safety, and performance. Consumer Reports’ tester found the electronic shifter difficult to navigate, and the iDrive infotainment system complicated and cumbersome. But the handling and performance pleased testers, as you’d expect from a company that says they make the Ultimate Driving Machine. On top of the list price, BMW charges for many things that are standard on other SUVs, like cameras, collision and lane departure warning systems, the optional third row seat, LED headlights, keyless entry, and wood trim. Still, if you want luxury combined with utility, there’s nothing like it.